12 1/2" x 16 1/2" x 5 1/2"
Bag Weight: 4 lbs. 10 oz. The traditional flap-over leather brief is a timeless classic. Ours is adorned with a beautiful custom engraved Bosca key-lock enclosure. We've designed it for upright standing so this baby is hard to tip over. Your laptop, tablet or iPad will probably be safer here, than anywhere else. I bought this bag and it has had to be replaced twice by Bosca. If you carry this bag via the shoulder strap which I do nearly exclusively, the design of the strap connections to the sides of the bag cause the strap and buckles to rub against the sides of the flap over, wearing the sides out very seriously and becoming very ragged. If the bag had a leather edge it would be more durable, but it has some sort of a plasticized sealer around the edge of the leather which will break up and ravel off. so, if you are not going to carry via the strap, this is a wonderful bag, but if you plan to carry it over the shoulder, you will be quite unhappy, I believe. As I said, mine was replaced twice and now my third bag is as bad as the first which I returned. Bosca customer service was great, but it could do nothing about the design deficiency of this bag, which needs a strap design similar to the other non gusset flap over brief they have available now. I only wish my bag had been replaced with that one. This the fifth or sixth item I have purchased from Bosca and I am once again extremely satisfied! I also receive many compliments for my Bosca collection. An unbelievable work of craftsmanship! This is a beautiful briefcase and very practical. Plenty of space and well organized. This baby will last a lifetime. Thank you! No padding in the computer compartment? This is such a stylish briefcase, classic, practical and timeless, I get compliments wherever I go; but why is there no padding in the computer side? This just doesn't make any sense. Beautiful leather. Exactly as described. Buy with confidence. This was a gift for my son who just secured a new position. He is very proud of his briefcase and feels the quality is excellent. Great looking bag in black. Solid construction and beautiful leather. Lots of positive comments at work. Love it ! I have been practicing law for 14 years and this is the best briefcase I have owned. 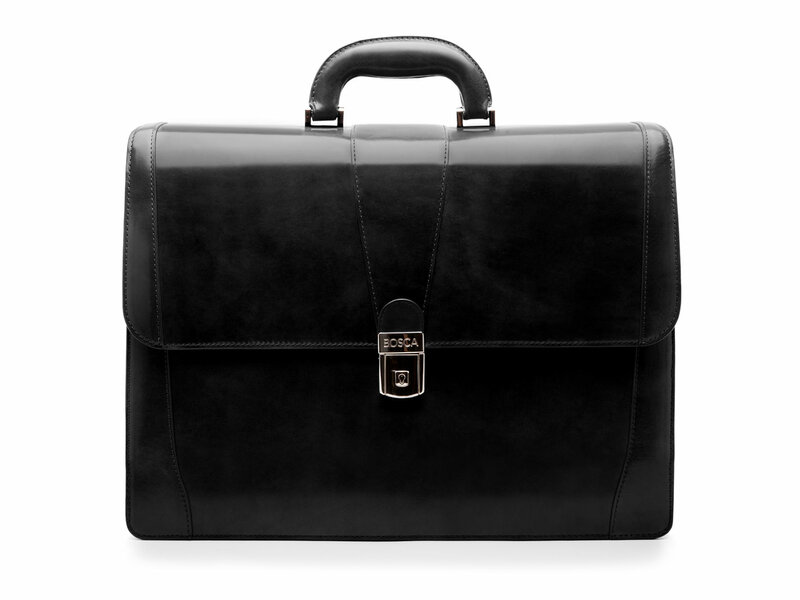 The leather briefcase has fine detail and is well constructed. Receive many compliments. Extremely happy. 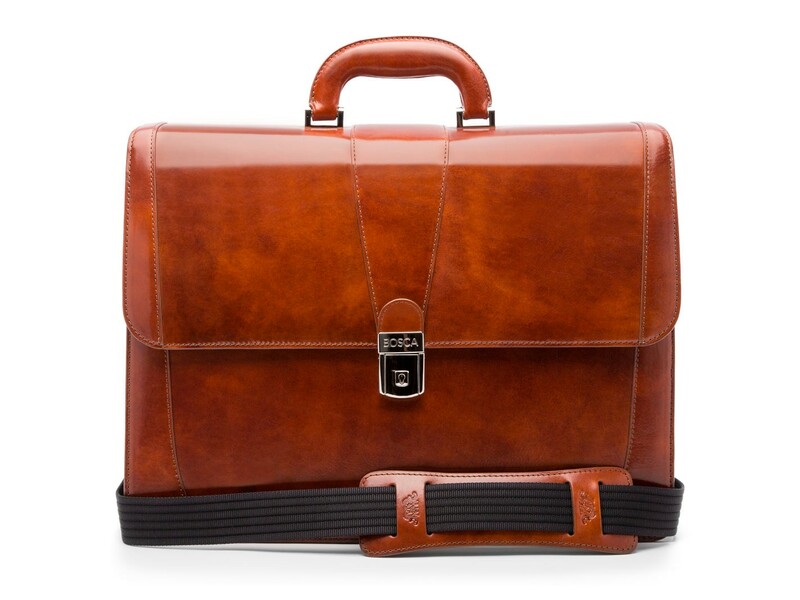 Would definitely recommend this leather briefcase to friends and family. Truly well crafted. I also purchased a leather wallet for which I am equally happy with the purchase. Your products are well made and will last a lifetime! Thank you.